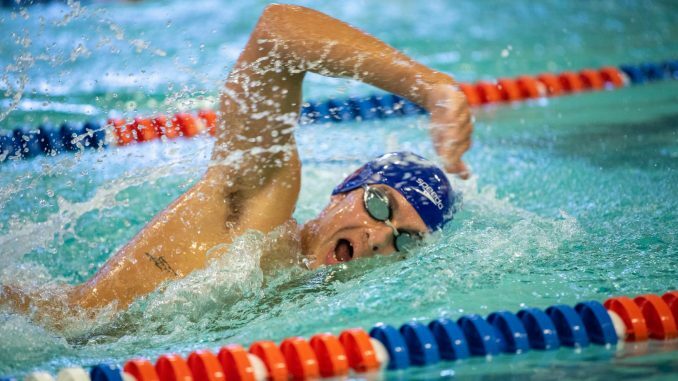 After back-to-back victories over Purchase College and rival SUNY Oneonta, the Hawks men’s and women’s swimming teams traveled to Burt Flickinger pool at Erie Community College (ECC) on Sunday, Feb. 2 for the SUNY Geneseo Invitational. New Paltz was greeted by a familiar face in Nazareth Golden Flyers coach Scott Whitbeck, who coached the Hawks back in the 2015-16 season. At ECC, the women’s side finished third (378) out of the five competing teams ahead of Buffalo State College (202) and Monroe Community College (109) and behind Nazareth College (661) and SUNY Geneseo (837). The men’s side also finished third (396) out of the five teams ahead of Buffalo State College (349) and Monroe Community College (310), behind Nazareth College (686) and SUNY Geneseo (770). The Hawks failed to secure a first place finish on either side, however, they still managed to have some impressive swims. On the men’s side, first-year Ethan Bonney secured a time of 10:23.38 in the 1,000-yard freestyle coming in just short of a first place finish by five tenths of a second (10:23.33). Fourth-year Yaya Toure secured a second place finish in the 100-yard backstroke (57.15) while fourth-year Barrett Celecki placed third in the 200-yard freestyle coming in at 1:49.40. The highlight for the men, however, was second-year Thomas Barnitkowski who secured a lifetime best in the 200-yard butterfly (2:13.95) coming in fifth behind first-year teammate Luke Gamboli (2:12.19). For the women, second-year Tessa Griger brought in the best finish clocking in at 2:18.92 in the 200-yard backstroke good enough for second place. Third-year Chelsea Angulas secured fourth place finishes in two events coming in at 56.39 in the 100-yard freestyle and 2:21.27 in the 200-yard individual medley. Donlevy added a fourth-place finish of her own in the 50-yard freestyle (26.31). The lady Hawks also added a second place finish in the 200-yard freestyle relay (1:43.75) consisting of fourth-year Nicole Lee, third-year Sarah Crespo, Angulas and Donlevy. The Hawks will head back to ECC at the end of the month for the State University of New York Athletic Conference (SUNYAC) Championships held between Feb. 20-23 at the same Burt Flickinger Pool.